Sacred and choral music composed during the Baroque period and afterwards (such as Bach's cantata cycles and Passions) included a "continuo" group in the score, part of which included a keyboard instrument, more often the harpsichord; the continuo always had a keyboard instrument in it for harmonization of the chords. 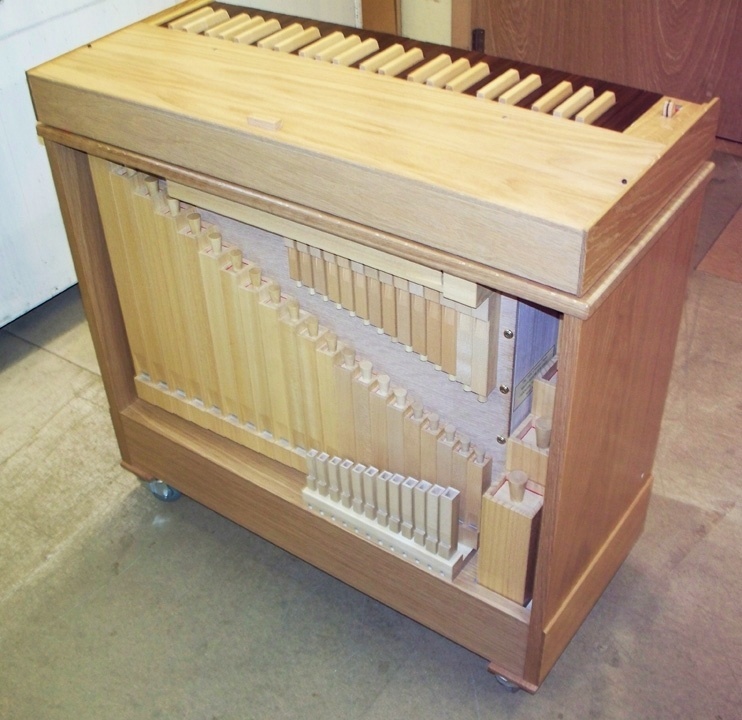 An organ was sometimes chosen for performing the keyboard part of the continuo; these days, small, continuo organs (photo) of merely 2 or 3 stops and one manual are being built with mechanical key and stop action and a compass of about 4 octaves, all on wheels to make the instrument portable; while sometimes a few of the small pipes in these instruments are of metal, they're more typically all made of wood, voiced gently, and are controlled by small levers. Despite their small size, the sound of these instruments carries fairly well due to the wide scale of the wooden pipes inside it. When there are 2 stops, typically it's an 8 foot covered flute paired with a covered or half covered flute at 4 foot pitch; in a 3 stop instrument a third open wooden stop of 2 foot pitch labeled Prestant is typically found. If there is a fourth stop, it's usually an open or covered wooden mutation half stop labeled "Q," which stands for "Quint Treble," which is provided, more commonly, at 1-1/3 foot pitch; being a "half stop," this rank is playable only from middle c# upwards. An instrument of this type is supplied with no pedals; modern examples are equipped with an inbuilt blower and, very often, wheels which permit it to be easily moved. There are some who feel that it makes more sense to use a keyboard instrument with a percussive nature, like the harpsichord, for the role of supplying the figured bass harmony [See blog, Figured Bass (Continuo)] in the continuo, to contrast with the other sustaining orchestral bass instruments in the continuo (commonly cello, but also bassoon and contrabass); to use another sustaining instrument like the organ for the purpose of supplying the figured bass harmony, for some listeners, seems to fail consistently in the recordings they've heard; then again, even the continuo harpsichord often sounds to some listeners as little better than a pitchless, tinkling buzz on recordings. Of course, none of this debate relates to the role of the organ as a concertante or obbligato instrument in the cantatas. It was, in the days of Bach, and still is, up to the keyboard to supply the whole harmony of the continuo part, even in song accompaniments, where the string and/or other accompanying instrument(s) play the bass note; in some of Bach's scores, the keyboard (harpsichord) AND the organ play the harmony. The bulk of the evidence (both in the music, and in historical records) point toward both harpsichord and organ being used when available, along with the other continuo instruments (sometimes together, or sometimes deployed separately for musical or practical reasons in individual movements or passages). The word "continuo" therefore does not automatically imply harpsichord in itself, in this or any other repertoire; it's the general term for anybody who might be deployed on the bass line, according to circumstances, not prescribing any certain instrument or set of instruments.